“Mission: Impossible,” the comparatively quaint 1966-1973 TV show, seems like a distant memory at this point. 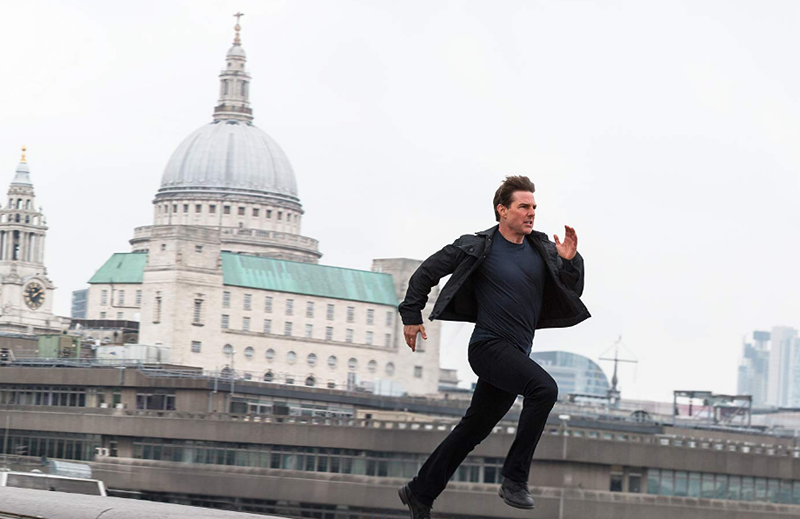 For over twenty-two years, the reliably muscular “Mission: Impossible” film series has wisely kept doubling down on the globe-trotting and daring stunt work that one can’t wait to see Tom Cruise in the tenth installment when he’s in his sixties, still powering through if fatigue hasn’t yet set in. Stylistically different from one to the fifth, each entry has had one key sequence everyone remembers it by—2011’s “Mission: Impossible - Ghost Protocol” had Cruise scaling Dubai’s Burj Khalifa with only a pair of thermo gloves and 2015’s “Mission: Impossible: Rogue Nation” had Cruise holding onto a cargo plane, a catwalk scuffle above the stage at the Vienna Opera, as well as an anxiety-inducing underwater mission—and this time, returning writer-director Christopher McQuarrie delivers a plethora of death-defying, white-knuckle doozies. 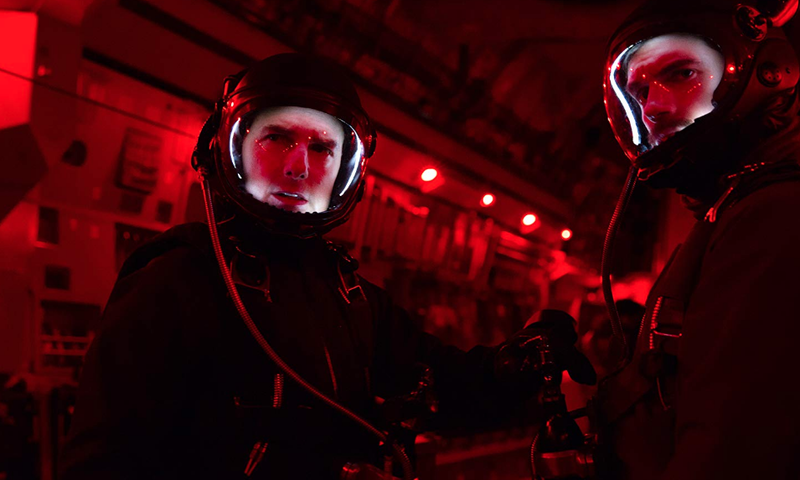 Surprisingly, somehow, the sixth time is the charm with the sixth installment, “Mission: Impossible - Fallout." With the knowledge that captured anarchist Soloman Lane (Sean Harris) has had a group known as “The Apostles” doing his bidding of global terrorism, Ethan Hunt (Tom Cruise) and his Impossible Mission Force team, including Benji (Simon Pegg) and Luther (Ving Rhames), meet in Berlin to collect three balls of plutonium that are being planned to be turned into nuclear bombs. 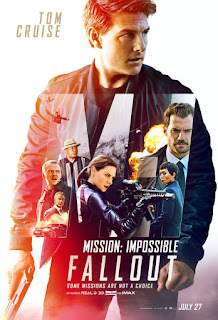 Losing sight of the plutonium, Ethan—who, mind you, is already having nightmares of losing wife Julia (Michelle Monaghan), whose death was faked for protection—makes the risky choice of saving his team over his mission of stopping an unprecedented threat that will destroy millions of lives. From there, CIA Director Erica Sloane (Angela Bassett) steps in, instructing Special Activities operative Agent August Walker (Henry Cavill) to lead the mission in retrieving the plutonium. En route to Paris, Ethan and Walker are off in search of an enigmatic weapons dealer, going by alias “John Lark,” and then a broker named the White Widow (Vanessa Kirby). Meanwhile, British Intelligence operative Ilsa Faust (Rebecca Ferguson) shows up with her own secret mission. 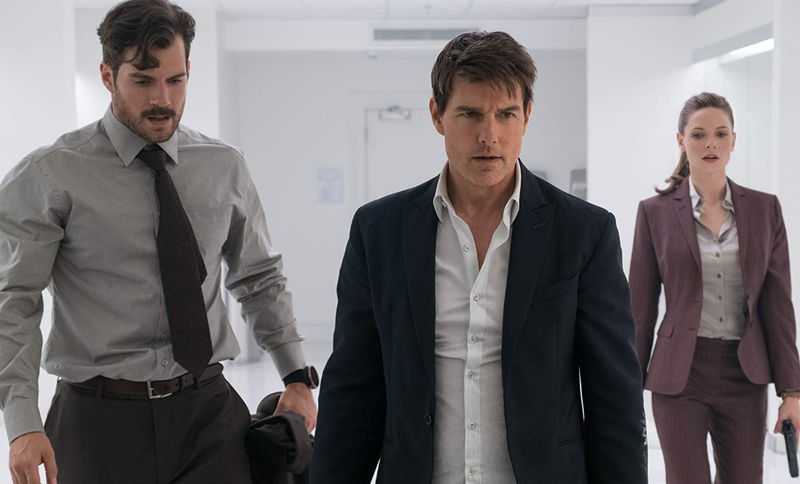 More of a direct sequel to “Mission: Impossible: Rogue Nation” than a stand-alone mission episode, “Mission: Impossible - Fallout” is electrifying for all 147 minutes with little letup. By now, these films essentially exist to prove how much of a daredevil stuntman Tom Cruise can be. The plot is absorbing enough as these things go, and helmed with a fluid propulsion, it works as a solid base on which to build action set-pieces that set this series apart from any other action spy picture. Parceled out evenly as to not feel front or back-loaded, said set-pieces are all riveting and stupendously devised. There’s a harrowing HALO jump from 25,000 feet into Paris during a lightning storm and then landing on the Grand Palais; a brutal, cohesively edited brawl in a men’s restroom; a motorcycle chase through the streets of Paris against oncoming traffic without a helmet; and Ethan’s thrilling pursuit of a baddie in an on-foot chase that leads to a rooftop jump. The climactic detonation countdown in a Kashmir medical camp, complete with the cutting of a red wire, even ups the ante, cross-cutting between three different locations with time-sensitive suspense. One-upping all action movies that use aerial fights, there is a spectacular sequence involving dueling helicopters above the snow-covered mountains, followed by a cliff-hanging homage to 2000’s “Mission: Impossible II” with Ethan doing a little rock-climbing and not recreationally. 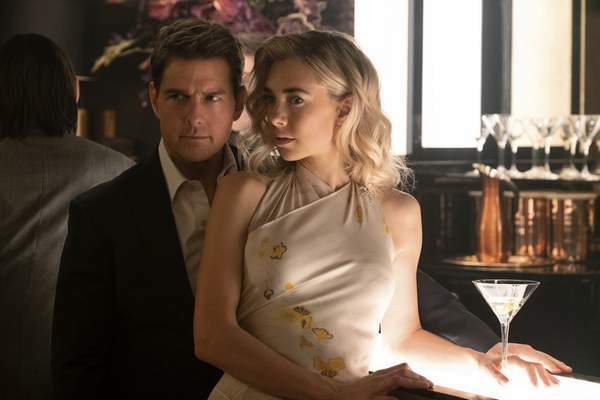 The constant of every “Mission: Impossible” film, Tom Cruise is forever up to the task of taking on a new mission in a film, much like Ethan Hunt, and will do anything to nail a derring-do. It’s apropos that not much is ever learned about Ethan’s personal life beyond his moved-on wife, Julia (Michelle Monaghan), who does make a comeback this time. 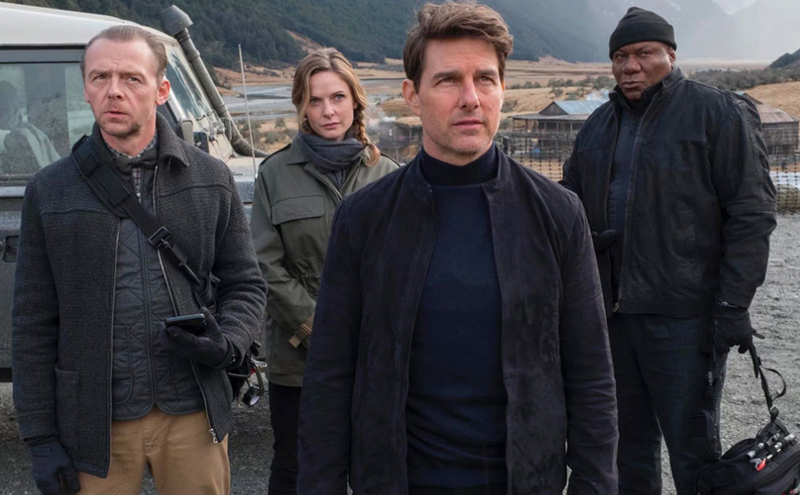 Rebecca Ferguson all but stole “Rogue Nation” from Tom Cruise, and once again, she is a force to be reckoned with as Ilsa Faust but also empathetic to the reality of Ethan’s previous relationship. Additions to the series, Vanessa Kirby (Netflix’s “The Crown”) is a bewitching specimen as White Widow, and Henry Cavill, now paying off that notorious mustache that distracted from most of his Superman scenes in “Justice League,” is a magnetic foil as Agent Walker. All of the supporting players get something worthwhile to do, including Simon Pegg, Ving Rhames, and Alec Baldwin, respectively, as Benji, Luther, and IMF boss Alan Hunley. 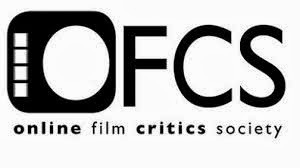 There are a series of deus of machina that occasionally lessen the life-or-death stakes, but the film also has the sense to rag on itself when Erica Sloane derides the IMF for their use of masks, comparing them to “grown men in rubber masks playing trick-or-treat.” In terms of crackerjack action filmmaking, writer-director Christopher McQuarrie, Tom Cruise, and everyone involved make the sixth installment in a twenty-two-year-old series more invigorating than it should be. Not only is Lalo Schifrin’s classic theme still here, but Lorne Balf’s excellent score is more evident than ever with the tones of a political thriller. “Mission: Impossible - Fallout” still isn’t a deep picture, although it does close on an emotionally satisfying note, and for adrenaline junkies, it will play like gangbusters. All of the remaining summer tentpoles might as well pack their bags.